Part One of this article discussed wildland fire fuels, fire spread, and possible causes. Part Two covers the investigation of wildland fires. Wildfires should be investigated using a systematic approach. Below are the suggested key elements of such an approach. The general approach in interFIRE VR can be adopted for a wildland fire. be careful when disturbing fire debris. If the underlying material layers are still hot, moving the debris around can expose the heated material to oxygen, causing it to combust. As with a structure fire investigation, protecting the integrity of the fire scene is the key to preserving evidence. All scenes should be treated as a potential crime scene until the cause has been determined to be accidental or natural. Traffic through potential area(s) of origin should be limited to only necessary personnel for fire suppression, safety and investigation. A perimeter should be established and secured by physical barrier (rope, tape, etc) and law enforcement personnel deployed to enforce it. However, many wildland fires burn very large areas and it may not be possible to encircle the perimeter of the entire burn area. In these cases, the investigator should identify potential area(s) of origin as soon as possible, then establish a physical, patrolled perimeter around those areas. All personnel who enter and exit the area should do so through controlled points, logging in and out. Taking contact information from all witnesses as soon as possible. Recording vehicle tag information for vehicles in the wildfire area, as well as location and direction of any moving vehicles. Recording physical descriptions and contact information of anyone in a crowd watching the fire; arsonists have been known to watch their handiwork. Also record information for anyone on horseback. Documentation includes the same best practices as a structure fire: photographing fire patterns, photographing all evidence items in place, creating necessary diagrams with all features and sampling locations noted, and keeping an evidence log. Aerial photographs may be particularly helpful in a wildfire investigation. With preservation, observation, and documentation underway, the systematic approach for evaluating the scene is the same as for a structure fire: determine area of origin, then determine cause and chain of events. Determining origin is often a process of tracing back the fire flow from the front of the fire to the area of origin. To assist the investigator, there are numerous indicators of how the fire spread and which direction it came from. Because so many factors influence a wildfire and interact to produce different effects, the investigator should seek to establish a pattern of indicators and evidence, not solely one factor. In addition, maintain an open mind about what you see and follow where it leads you. Change the theory to suit the facts, dont change the facts to suit the theory. Timothy G. Huff, former Chief Law Enforcement Officer for the CA Department of Forestry and Fire Protection and former arson profiler for the FBI, notes that even though investigating wildland fires can seem a daunting task, it's a process that yields results. Huff says, "The fastest way to narrow the origin of a large fire is to find witnesses who saw the fire in its early stages, which can include responding firefighters and passerby witnesses. Beyond that, by the use of indicators, you can track the fire back to the area of origin. These indicators include impingement of flame, char, and soot patterns on natural and man-made objects. You track back those gross indicators to an area of origin, then you get on hands and knees and are looking at minute features like grass stubble and pebbles. Once you get it down to an area about the size of a tabletop, then you are looking for very fine indicators of cause, like matchsticks, cigarettes, fulgurites from lightning, or metal flakes from tailpipe exhaust." Let's break down this process. Pictured above: Damage after the Willie Fire (Red Lodge, MT). Photo credit: Karen Wattenmaker. Photo courtesy of the National Interagency Fire Center. When analyzing fire flow, investigators refer to the "fire head" and "fire heel." The fire head is the portion of the fire moving most rapidly, and generally is the most intense. Fire heel is at the opposite side of the fire head. According to NFPA 921, the fire at the heel is less intense and will generally be "backing," or burning slowly against the wind or downhill. Wildfire "V" patterns. A wildfire "V" pattern is not the same as a "V" pattern in a structure fire. A structure fire "V" pattern is generated by a plume of flame spreading vertically from the base of the fire. In a wildfire, the "V" pattern is a horizontal burn on the ground's surface, where the base of the "V" may be the point of origin. The pattern is affected by wind direction, slope, and other factors. Degree of damage. Fire intensity and direction can be gauged by the degree of damage to fuels. Damage to vertical items like trees will be greater on the side from which the fire approached. Therefore, the direction the more damaged sides face points toward the area of origin. However, this indicator is not absolute. Timothy G. Huff asserts, "In a fast moving fire or one burning upslope, a wrap-around effect on the far side of the tree may be noted." Grass stems. Fire burns the grass stem bases first and the stalks fall over because their weight is no longer supported. Stalks that fall forward are subsequently consumed as fire moves over them. Stalks that fall backward sometimes remain unburned and generally point in the direction that the fire approached. However, the direction of fall may be influenced by wind and should not be taken as the single absolute indicator. Walking in the direction the unburned stalks point can bring the investigator closer to the area of origin. Brush patterns. When fire starts in ground fuels, as many wildfires do, it takes a period of time for that fire to generate enough heat and intensity to spread to aerial fuels. Therefore, at the back edge of the fire, which may be near the point of origin, less upper foliage may be burned than at the front of the fire. In addition, at the back edge, there may be upper branches that have fallen to the ground unburned because the fire under them, which had not yet reached the treetops, burned away the support for the upper branches. The pattern of ash dispersion can assist in determining wind direction. The amount of ash can indicate the relative amount of fuel load. Where ash fell on intact fuels may assist the investigator in determining the sequence of the burning. Pictured above: Cupping behavior in a fallen log involved in the Mineral Primm Fire. Note the ash and soot deposits in front and the green vegetation of an unburned area behind. Photo credit: Karen Wattenmaker. Courtesy of the Northern Rockies Incident Information Center. Cupping. If a fire burns away the tree trunk, the remaining stump will be "cupped" on the side facing the fire (see Fig. 13). The sharpened point will be on the side away from the fire's approach; thus the cupped sides face in the direction of the fire origin. This effect can be seen on many types of vegetation, including grass. On grass, the protected side can be felt by rubbing the hand against the grass. When rubbed in the direction the fire burned, the grass feels velvety. Die-out pattern. As the fire dies, there is less damage and charring. Thus, moving into the more damaged areas from the die-out edges brings the investigator closer to the fire origin. 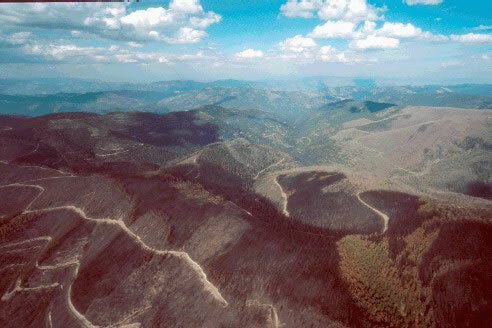 Pictured above: Damage after the Pinion Ridge Fire. The yellow arrow points out the char on one side of the tree trunk. Photo credit: Kari Brown. Photo courtesy of the National Interagency Fire Center. Charring and tree damage. Charring is deeper on the side of the fuel facing the oncoming fire because that side faced the heat of the fire (see Fig. 14). Relative char depth can help the investigator determine which side is more charred. If the investigator puts the deeper char to his/her back and walks, they are walking toward the origin of the fire. The same is true of destruction of vegetation; it will be more severe on the side the fire approached from. As fire spreads up a tree, the wind will drive the fire away from windward foliage, leaving it less damaged. Sometimes, the treetops may have a triangular unburned area on the approaching fire side. Fast moving fire can "bevel" the ends of branches, blunting branches on the approach side and tapering branches on the other side. Walk in the direction the rounded branches point to walk toward the fire's origin. Patterns on unburned items. Direction of fire travel and intensity may be indicated by sooty deposits left on unburned and/or noncombustible items. These indicators can be protected items and patterns, heavier staining and sooting on the side of an item that faced the approaching fire, and loss of material as indicated by lines of demarcation. The heat damage on non-combustibles will be greater on the side from which the fire approached because the object shields the back of the object. Non-combustibles can include signs, rocks, steel fenceposts, and stone walls. Very large noncombustibles can provide a barrier to fire movement, protecting the items and areas behind them. Contradictory indicators. Contradictory or confusing indicators are often present close to the fire origin because, at the time they were created, the fire was undeveloped and had not yet established a direction. Fire damage may be close to the ground only and items may be only partially burned in strange ways. As the investigator analyzes the fire flow and comes to understand the scene, possible items of evidence may come to light. A full scene search of the area of origin should be conducted. The search of the fire scene must be conducted using a systematic method suitable for an open area, such as a grid method or line method. As with any search, the search team should mark evidence with a flag or cone as they encounter it, then move on. More experienced investigators can then evaluate each marked item and determine if it should be collected. Timothy G. Huff characterizes the evidence search as "hands and knees, looking for very small indicators and items of evidence." Evidence collection procedures are the same as for structure fires. Photographic documentation and logging should continue throughout the examination and evidence search. All indicators and collected evidence should be mapped onto a sketch. Multiple sketches may be required, depending on the case. It may seem that searching for evidence of the fire's cause in a large blaze is looking for a needle in a haystack. But that needle can be found. Paul Steensland, a senior special agent with the U.S. Forest Service, found "...three matches stuck head-first into the ground, spaced a half-inch apart," at the point of origin of the Hayman Fire, which burned 137,000 acres and destroyed 133 homes southwest of Denver, CO (Inland Valley Daily Bulletin, 1 November 2003). Investigators believe that Terry Barton, a former Forest Service seasonal worker who pleaded guilty to starting the Hayman Fire, put the matches in the ground. Even after that devastation, the evidence was still there. Witnesses to the incipient fire. Witnesses who are present when the fire starts and/or those who first report the fire may have seen it in its early stages and can provide information on the physical characteristics of the fire, anyone else seen in the area, and the location and behavior of the fire. Other witnesses who observed the fire, persons in the vicinity of the fire, and situations and events surrounding the fire. Neighbors and persons familiar with the area where the fire started. These persons can provide information on and facts about that area, including common and uncommon activities in and uses for the area of origin. For example, they may know that the area is a popular off-roading destination or that cars are rarely seen there or that teenagers often build bonfires and holding drinking parties. Agencies responsible for tracking fires, predicting weather, and recording natural disasters. Wildland fires may be caused by lightning, natural disaster, or other Earth event. All possible natural causes must be considered and eliminated. Data collection agencies can provide the necessary information to determine if a natural cause might be possible. NOAA can advise on lightning strikes, and U.S. Geological Survey can provide data on natural disasters, including volcanic activity. Utility companies. Fires can be sparked by utilities equipment, including electricity, gas, and oil. Two common causes are electrical power lines being downed by weather and transformer malfunctions that shower flaming and/or sparking debris to the ground. Check with the utility companies to determine if a malfunction occurred in the fire area and how it might have caused ignition. Private and commercial pilots. Often, wildland fires are initially spotted by pilots, who then report them to the tower. In addition, pilots have a unique perspective on the development of the fire because they view it from the air. Record aircraft information, including N-number (visible on the side of private planes) of any aircraft seen in the area. Follow up this information with the local airport and inquire about who was flying at the time of the fire, using the logs to determine who the pilot(s) were. Then, contact those persons for an interview. Be aware that arsonists have been known to set wildland fires from an aircraft. Pictured above: Aerial photograph of Colony Ridge fire patterns on Plum Creek land. Photo credit: Kari Green. Courtesy of the Northern Rockies Incident Information Center. Aerial surveillance such as satellite imaging, video reference footage taken from aircraft, and infrared imaging can provide a visual record documenting the fire's development and may assist in determining the area of origin and pattern of fire spread (see Fig. 15). Encourage responding fire companies to employ the suppression limitation activities described in the "Influence of Wildfire Suppression Tactics" section of this article. If possible, mark the potential area(s) of origin and advise law enforcement and firefighters to avoid them in an effort to preserve evidence. Set up a patrolled perimeter marked by physical barrier (such as tape) to keep onlookers out of these areas. As practical, avoid potential evidence areas (often those closest to the heel of the fire and where the burn began, as well as near access points like roads), minimizing foot traffic and equipment. Exercise care in moving equipment. This will minimize damage to fire patterns and potential evidence. Notify the Incident Commander if you observe any possible pieces of evidence, strange events, or unknown persons and vehicles. Although wildland fire investigation involves different fuels, different indicators, and different fire spread principles than a structure fire, the same strong investigative principles still apply. The following keys to effective wildland fire investigation will help all investigators determine origin and cause with greater accuracy. Appropriate Training. The typical fire investigator probably sees mostly structure fires. Therefore, the investigator may have little experience with a wildland fire investigation when called upon to undertake it. According to Timothy G. Huff, "Experienced structure fire investigators will quickly adapt their knowledge of structure fire spread indicators, like char patterns and soot deposition, to the wildland fire. However, some aspects of wildland fire investigation can be tricky, like backing fires vs. running fires, so the investigator shouldn't assume they are prepared for the wildland fire investigation." Training in wildland fire investigations will better prepare the investigator to decipher what they will see in an open area fire. As always, if the investigator feels that the investigation is beyond his or her capabilities, the most important step they can take is to call upon expert resources for assistance. A Systematic Approach. The investigation of a wildland fire can be approached with the same basic protocol as a structure fire investigation. A systematic approach like the one presented in interFIRE VR includes tasks such as securing the scene, preserving evidence, making documentation, interviewing witnesses, searching for and collecting evidence, analyzing the fire flow, eliminating all potential accidental causes, and determining cause and origin. Depending on the phase the fire is in when the investigator arrives, the order in which tasks are completed can be adapted. For example, if the fire is still actively involved and entrance into the area of origin is not possible, begin with taking witness information, vehicle tag numbers, and similar tasks. Keen Observation. Many wildland fires leave devastation in their wake. However, not everything is necessarily destroyed. "Surprisingly, matches are not fully consumed by wildland fires," states Huff. "You can find them, but you have to get on your hands and knees and look very closely." Keen observation, and patience in applying it, will help the investigator find the needle in the haystack. Documentation. Huff advises that documentation is key to an effective wildland fire investigation, "Photographs, sketches, evidence collection and chain of custody documentation are all are necessary." Local Knowledge. Get to know the area and what goes on there. Ask witnesses, nearby residents, and recreationers what goes on in that area, both legal and illegal. Learn the patterns of utilities, machinery, vehicles, and other potential sources of ignition. If possible, track what happened in the time before the fire. Ask questions like: was someone camping in the area? was there a lightning strike? did the utility company report equipment issues? was there a motor vehicle accident? did a train travel through? Think through all these possible sources of ignition and do the homework necessary to eliminate or substantiate each potential cause. Common Sense. Apply common sense to the fire indicators you see to develop and test possible theories. If the fire started near the roadside, think through how someone could have accessed the area and examine the routes of access for footprints and tire prints. If the fire origin is near equimpment, investigate how it might have been involved. Travel as many avenues as necessary. Huff notes, "Sometimes, even if you do all your hands and knees examining, you don't find anything. If the investigator is thorough and there's nothing there, think about the possibility that the fire was set with something that was taken away from the fire scene, such as a cigarette lighter." Investigating wildland fires can be a departure from the regular routine of examining structure fires. In addition, many wildland fires that investigators see will be small, far smaller than the massive wildland fires many associate with the Western U.S. However, investigation of every fire is important; a small fire may be a starting point for a serial arsonist, or may be an indication of a potentially catastrophic equipment failure, or a harbinger of a safety hazard. Understand the basics of wildland fire dynamics and the requirements of the investigation. Apply your systematic approach, and don't hesitate to call for assistance. Huff is practical about wildland fire investigation, "Be prepared for that period of confusion, when you are seeing a lot of things that don't make sense immediately." Take the time and care to work through this confusion and sort out where the indicators point you. Most of all, know when to ask for help. There are investigators with significant expertise in wildland fires who can provide assistance. Contact your State Fire Marshal's Office or State Department of Forestry for more information. "Stephan Bridge Road Fire, Crawford, MI, 5/8/90." NFPA. Firewise.org Library Item 0188. "Fire Storm 91, Spokane, WA, 10/21/91." NFPA. Firewise.org Library Item 0197. "Black Tiger Fire, Boulder, CO, 7/9/89," NFPA. "Review of Forest Fires in South Dakota's Black Hills National Forest." NFPA, 2003. Cook, Rick. "Show Low, Arizona, Inferno: Evacuation Lessons Learned in the Rodeo-Chedeski Fire." NFPA Journal. March/April 2003. "NFPA Special Report: Wildland Fires Video." NFPA (25 minute video case study of three wildland fires). Michaels, Mark. "On the Job: California-Oakland Hills Fire Storm." Published in Firehouse Magazine. Dec 1991. Firewise.org Library Item 00190. "Oakland/Berkeley Hills Fire, October 20, 1981." Published on firewise.org. Firewise.org Library Item 00140. Butler, Bret W. et. al. 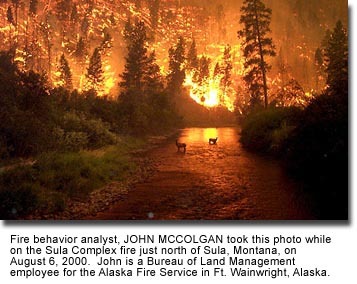 "Fire Behavior Associated with the 1994 South Canyon Fire on Storm King Mountain, Colorado." USDA-Forest Service. Published by the Rocky Mountain Research Station. 1998. Firewise.org Library Item 00201. O'Driscoll, Patrick and Kenworthy, Tom. "The Los Alamos Fire, Repeats waiting to happen all over the West" by . Published by USA Today, May 15, 2000. Firewise.org Library Item 00200. Graham, Hugh W. "Urban Wildlands Fire - Pebble Beach, CA, May 31, 1987." U.S. Fire Administration. 1997. Firewise.org Library Item 00198. "Thirty Mile Fire Investigation - Accident Investigation Factual Report and Management Evaluation Report." Published by the USDA Forest Service. 2001. Firewise.org Library Item 0115. Stolzenburg, William. "Fire in the Rainforest." Published by The Nature Conservancy. 2001. Firewise.org Library Item 00395. Dominquez, Roberto Martinez and Martinez, Arturo Raygoza. "The Worst Fire Disaster in Mexico." Published by Bombardier Aerospace. 1998. Firewise.org Library Item 00192.